In its second season at the varsity level, girls’ lacrosse finished out a demanding 4-14 season, with 10 of 18 games played on the road. 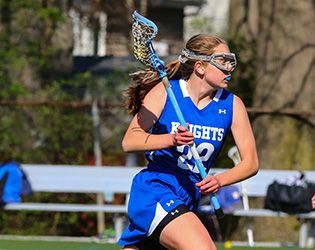 Along the way, the Knights reached some important milestones, including the first shut-out win for the program, the first berth in the NJSIAA tournament and the highest LAXPower rating in team history. In addition, the team set a new record for offense, with seven games in which the Knights scored 14 or more goals, and a new record for defense, with three games in which the team conceded four goals or fewer. April was marked by two wins: a 17-4 victory over Ranney on April 11 and a 15-0 win over Bishop Ahr on April 23. True team efforts, goals came from Andree Aloise '19, Emma Dean '17, Ava Diggins '18, Mikaela Gegelys '17, Amelia Kirby '18, Jennifer Lowe '17 and Amanda Weiss '18. On goal, Katherine Lioudis '18 contributed six saves in each matchup. Late in the season, the girls notched two big wins, defeating Edison 18-5 on May 14 and besting JP Stevens 16-4 on May 16. In the Edison matchup, Kirby scored 11 goals, setting a new school record for most individual goals in a game. She was subsequently named player of the week—the first in the program’s history—by NJ.com. In the JP Stevens matchup, co-captains Caty Matthews '16 and Katie Williams '16 each contributed to the scoring with a goal apiece. Looking ahead to next spring, the team will miss the leadership of Matthews and Williams. Five very talented juniors will return to the squad, however. Among them are four US Lacrosse Academic All-American designees: Dean, Cindy He '17, Lowe and Naya Shim '17. In addition, Gegelys will be an important part of next year's lineup. This season, she recorded 25 goals, two assists and nine ground balls and was voted MVP attack by her teammates. Sophomores comprised the bulk of this year’s squad, and the team looks forward to their return next spring. Among them, scoring powerhouse Kirby and goalie Lioudis will be expected to play significant roles. In addition, the team looks forward to the continued contributions of Diggins, Helena Digney, Catherine Davino, Ivana Mejia, Nikki Ruggiero and Weiss. This year’s lone freshman, Aloise, contributed 26 goals, nine assists and 27 groundballs and is expected to be a vital part of next year's offense. Reflecting on the season, head coach Janet Holdsworth offered, "We are so proud of this group of student-athletes. They worked hard, learned a great deal, exhibited grit, and achieved many 'firsts' for the program. We are excited for the future of the program and expect a good number of freshman to join these talented players in spring 2017 when we compete for the first time as a member of the Skylands Conference."